Bright and dark colours often attract attention to the fact that your nails are short and can make your fingers look shorter - so nudes are great! They're also incredibly versatile as they go with any outfit and look sophisticated. This colour is Marylebone Mews by Nails Inc - it's a grey colour with lilac undertones. For Christmas you could style this with one nail glittery on each hand for a bit of extra glam! For Spring you could use it as a base for some pastel polka dots! I generally apply two coats to give a good opaque look, but you can apply an extra coat for a slightly darker look. In terms of quality, I'm not convinced Nails Inc is the best polish to go for if you want to avoid chipping - I've had quite a few of their varnishes previously and by about the third day I generally can see chips. 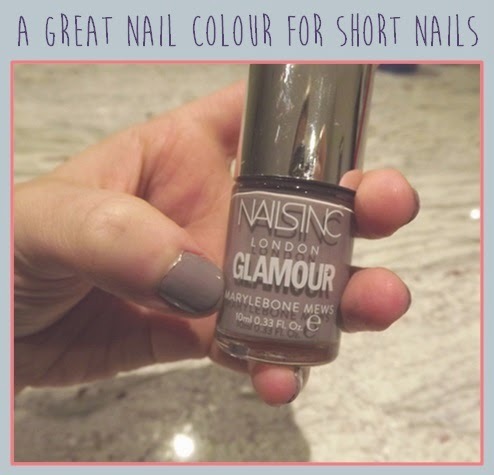 I got this in a recent promotion where Glamour magazine were giving away free Nails Inc nail polish - they also had three other colours which were ideal for winter - dark reds and purples! It's always worth checking the freebies in magazines!